On March 11, 20 13, Detroit offered a not so subtle peek into a future that should be avoided at all costs. 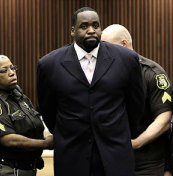 Former Mayor, Kwame Kilpatrick was convicted on multiple charges of fraud and racketeering for doling out no-bid contracts in exchange for kickbacks. This is not just a moral failing of Kilpatrick nor just business as usual in Detroit, a city that has been circling the drain for decades nor is it a powerful message that will curtail future corruption. Shakedowns, racketeering and extortion are standard practice in a neoliberal state. Neoliberalism claims to have a solution to the corruption typical of previous capitalist governmental formations – transparency. Making the budgets and processes of governance accessible to public view, neoliberal advocates claim, allows for greater scrutiny by the public. Simultaneously, the shifting of decision making power over aspects of traditionally public social services allows the more democratic, in the neoliberal view, gaze of shareholders operating on self-interest to discipline corrupt tendencies. There are at least two features of the Kilpatrick case that counteract these arguments. Kilpatrick’s close relationship with city contractor Bobby Ferguson offers a window into the degree to which the private sector has penetrated into the state. Ferguson, along with a series of unnamed construction companies, used the city government as a means to not only ensure a constant flow of profitable jobs, but as a means to discipline competitors through regulatory commissions. For example “Company J” demanded that Ferguson tell Kilpatrick that “we need somebody to go in there [at the construction site of Company C] and say ‘You know we’re gonna start (expletive) writing you up for every little (expletive) violation.” Here we see private capital literally harnessing the disciplinary power of the state and wielding in the service of eliminating competition. How far is the distance between this and Fowler’s role? The second feature of neoliberalism operative in the Kilpatrick case involves the manner in which the neoliberal state serves to under and de-value public properties in the service of private profit. Sometimes this happens in obvious ways through the privatization of publicly held properties – like energy, water or electric companies. Other times it is more subtle such as through the myriad of public-private ventures in which the private side is allowed to use the public investment as an insurance policy of profitability. The Book Cadillac Hotel project was one such example. The renovated hotel, now owned and operated by Westin Hotels and Resorts, was lavished with millions of dollars in public funds. $46 million in city and state loans were provided as well as another $33 million in state and federal tax credits. Kilpatrick guided Ferguson through the bumpy process of renovation in which the initial private partner pulled out. Kilpatrick’s motive became personal beyond the banal platitudes of “revival” and “renaissance” that accompany such vanity projects in defeated cities. The Mayor became the public insurer of the profitability of Ferguson’s private investment and, ultimately, the defender of the Westin group’s desire to profit at the expense of the public. Kilpatrick and Ferguson are going to jail. Westin Hotels and Resorts is headed to the bank. While Kilpatrick’s case may be distorted by the extent and arrogance of the corruption, his activities bear a close resemblance to those underway in cities throughout the country. Neoliberalism serves to introduce profit motive into the heart of the state in order to loot public assets. 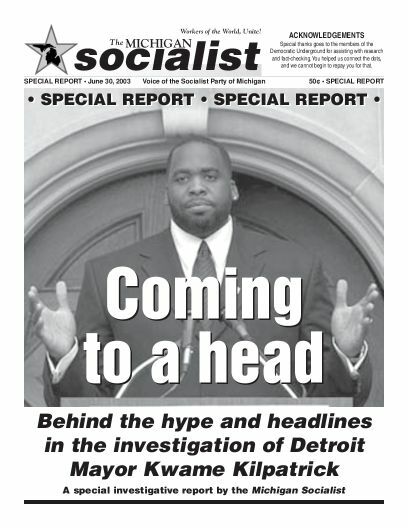 While Kilpatrick will spend a significant number of years behind bars, it will be business as usual for other public officials who operate the helm of the neoliberal state. The solution is a simple one -democracy. Not the kind of democracy that is purchased with a campaign donation, cultivated by a lobbyist visit, manipulated by slick public relations efforts or mobilized by fear. It is democracy that is operated directly. Democracy that flows from the grassroots up in order to challenge the increasing power of the Kilpatricks, the Fergusons and the Westins of the world. Statement authored by Socialist Party USA Co-Chair Billy Wharton and adopted by the SPMI State Executive Committee. This entry was posted in Statements and tagged Detroit by spmichigan. Bookmark the permalink.